California is one of my favourite places in the world. I fell in love with its diverse landscapes when I road tripped along Highway One with my boyfriend in 2017; which is why I am so frickin excited to have become the brand new ambassador for Visit California. (Someone pinch me!). This basically means that it is my job to share my experiences exploring this beautiful state with you, so expect tonnes of travel guides, itineraries and vlogs coming your way! My first trip as an ambassador was a road trip which took in beaches, mountains and deserts; kick starting between the palm trees of Newport Beach and ending at the dramatic mountains of Greater Palm Springs. It was an incredible experience and our itinerary was jam packed full of epic activities and beautiful scenery, which is why I wanted to share it with you. I hope it helps you plan your upcoming California adventures! Day 1: Arriving in America! Land into Los Angeles airport in the late afternoon, feeling refreshed after flying with Air New Zealand in their luxurious Business Premier cabin and tucking into their vegan doughnut selection. The dream! 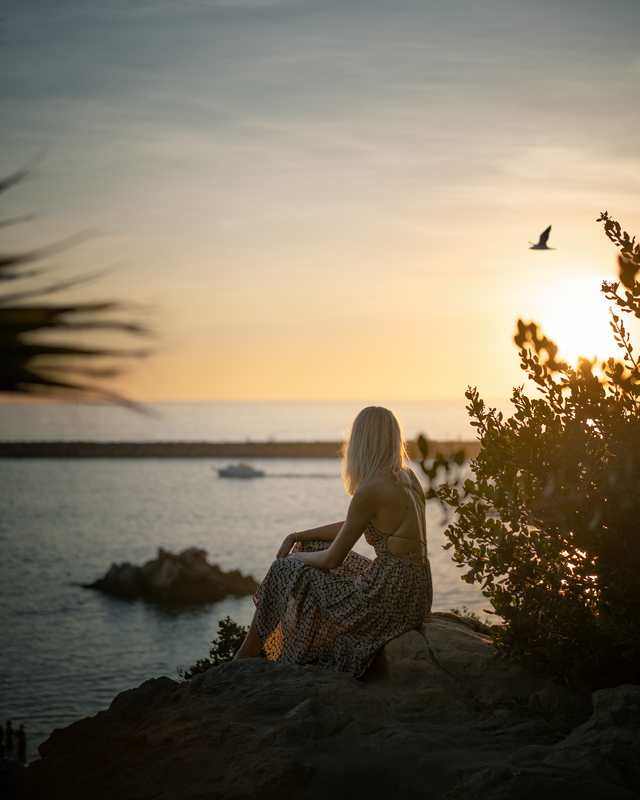 Take a one hour taxi to Newport Beach and check into theRenaissance Newport Beach Hotel. This hotel is perfectly located in the heart of Newport Beach and has a super chilled pool area for if you need some downtime before the road trip begins. Be sure to settle in and catch some Z’s. Grab breakfast at the hotel, they have an amazing selection including cold pressed juices and the most delicious acai bowl I’ve had in a long time! Hop on a Duffy Boat for the morning. These iconic boats can be sailed around the peaceful Newport Beach Harbour, allowing the perfect opportunity to take in the cities sights from the water. Grab lunch at Cafe Gratitude, a plant based restaurant which a focus on healthy and sustainable food. It is one of my favourites, be sure to try the Indian Bowl! 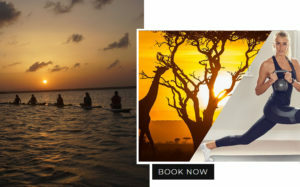 Catch a tan while stand up paddle boarding with Pirate Coast. Head to the Newport Beach Back Bay where there are calm smooth waters you can explore. This area is actually an ecological reserve; meaning you’ll be surrounded by nature and wildlife. Dine at True Food Kitchen. This eco-chic chain serves up health focused food with tonne’s of vegan options. Head for breakfast at Babettes– a popular local spot which focuses on organic, local and seasonal produce. They have a delicious tofu “omelette” which blew my mind! Explore Crystal Cove. This iconic bay is within walking distance of Babettes and has miles of uninterrupted coastline along with cute cafes. Be sure to head up onto the clifftop above it and check out the famous “shake shack” which serves super thick indulgent milkshakes. Check out of the amazing Renaissance Newport Beach Hotel. 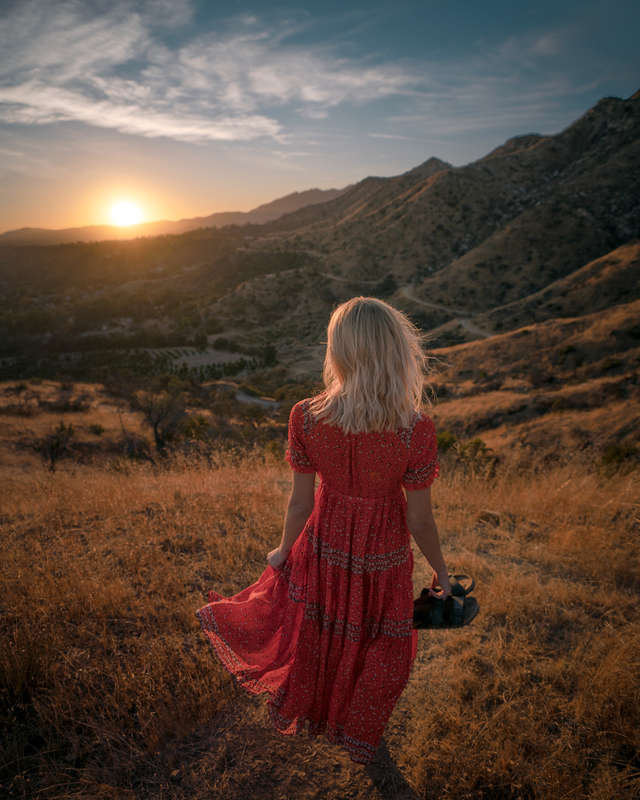 Pick up a rental car from your chosen provider at nearby John Wayne Airport and drive to the trendy town of Ojai. 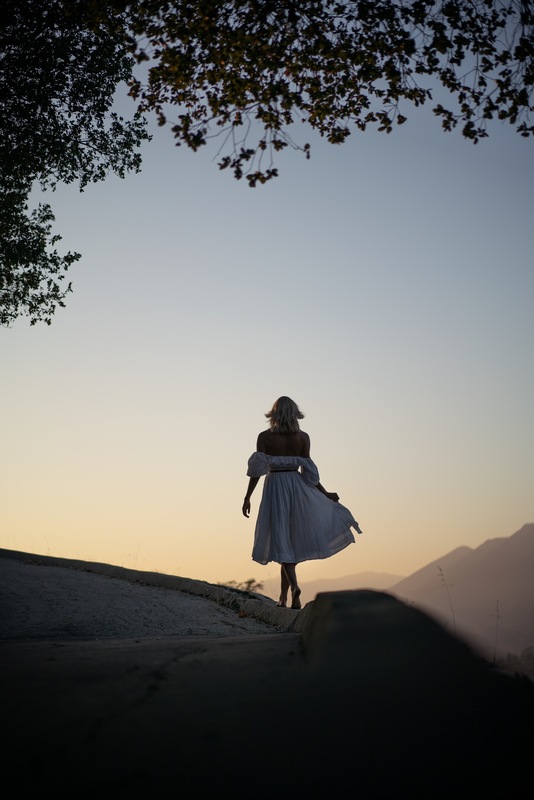 Ojai is small town nestled in a beautiful valley, a couple hours drive from Newport Beach. It has bundles of character and a “hipster” vibe (aka, theres a lot of ponchos and every guy has a ponytail and a beard!). 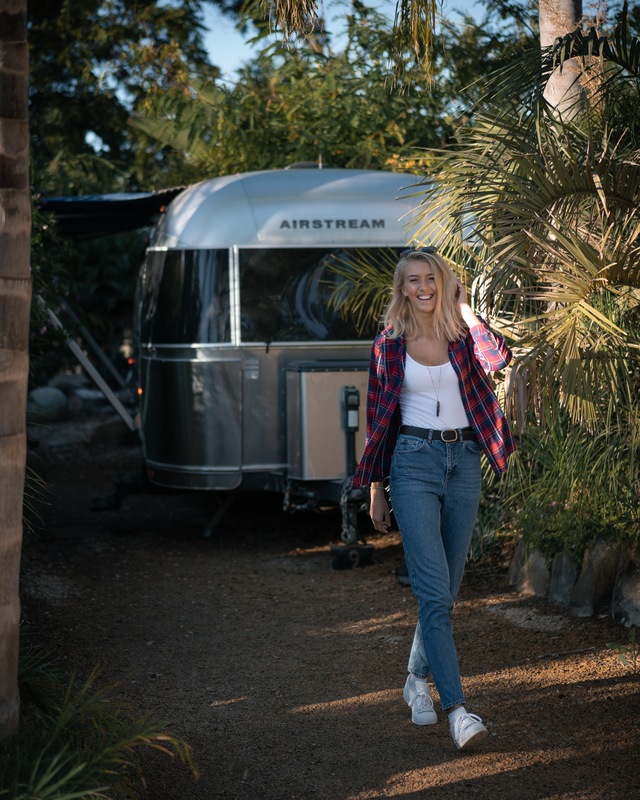 Check into Caravan Outpost for the night, an eclectic hotel where you stay in traditional Airstream caravans. It is such a unique experience, each caravan is full of its own character and the staff are lovely. Hike up Shelf Road Trail to watch sunset over the valley before driving toFarmer and the Cook for dinner – a casual but delicious Mexican spot with plenty of vegan options. Grab a bike from Caravan Outpost and take today as an opportunity to cycle around Ojai and see what hidden gems this town has to offer. I highly recommend brekkie at Beacon Coffee. They have the most delicious breakfast selection, including vegan cinnamon rolls, as well as locally sourced and roasted coffee. Ojai is home to some incredible independent shops. Highlights include Barts Books (a half indoor half outdoor book store), In the Field (for bohemian home accessories) and The Fig (my favourite, a treasure trove of ceramics, decor and gifts). You can spend hours browsing them. Tuck into lunch at The Nest, a popular local spot with a diverse menu which caters for veggies, vegans and meat eaters alike. The buddha bowl is the bomb! Take a relaxed afternoon stroll through town, continue exploring on your bike or if you’re feeling more active you can tackle Pratt Trail, a beautiful hike which takes in the valley as well as surrounding ridges and peaks. 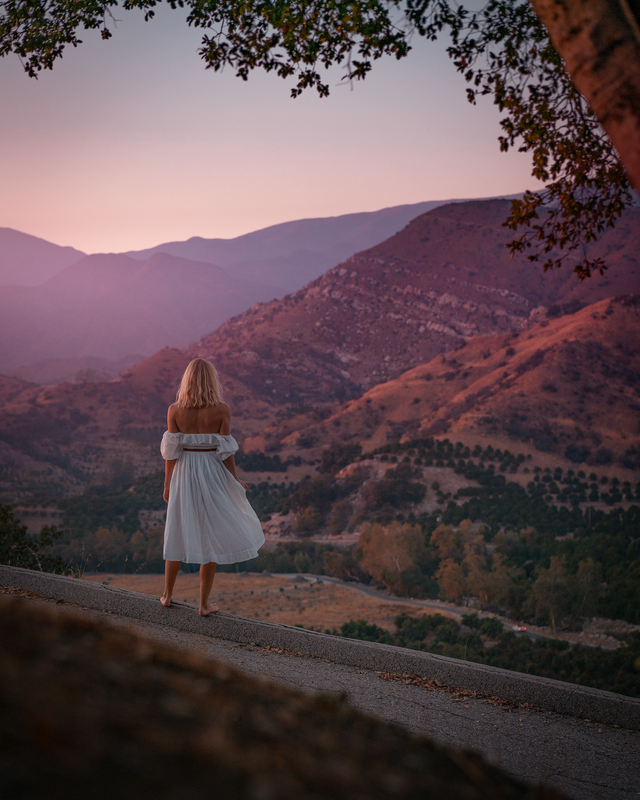 Ojai is known for its sunsets and the “pink moment” when the sun turns the mountains a beautiful rosey hue. My favourite spot to watch this was at Meditation Mount. Dine at Azu, a local restaurant which has the most incredible buffalo cauliflower and rosemary fries. Then head back to the Caravan Outpost for dessert – here you can cook up homemade s’mores on the campfire while snuggled up in blankets. Pack your bags, check out of Caravan Outpost and drive to a breakfast spot in town. I recommend the acai bowls and smoothies at Farmer and the Cook. Get on the road! This is the longest drive you will do on the road trip so stock up on snacks, water and plenty of fuel. Drive to Big Bear Lake via the San Gabriels Mountains. This scenic route may add an hour or two to your travel time but it is honesty so worth it. It takes in some absolutely incredible mountain roads with stunning valley views, I couldn’t stop looking out the window! Stop off in Lake Arrowhead for lunch and browse Road Trip (a curated shop of unique, vintage and handmade goods) in Cedar Glen. Check into Alpenhorn Bed and Breakfast, meet the incredibly lovely owners and share a bottle of wine with them by the fire. The hosts are so friendly that you will feel at home in minutes. Go to breakfast with an empty stomach, Johan your Alpenhorn BnBhost will feed you a minimum of three courses of absolutely mind blowing food. He is extremely talented and you will feel full all day!!! (Request his apple and almond scones, they’re life changing!). Explore on wheels. Go on a guided electric bike tour through the stunning landscapes surrounding Big Bear Lake with the team at Goldsmiths Sports. This is an amazing way to see as much of this destination as possible in a day. Be sure to request to cycle up onto the ridge above the valley to get the best views in town! Take a hike. I recommend hiking up Castle Rock Trail for sunset. When you get to the rock, climb right up onto the top to see the golden hour unfold over the surrounding forest and lake. Just make sure you wrap up warm and bring a torch for the hike down afterwards! Head back to your BnB, snuggle up by the fire and tuck into homemade snacks. Top Tip: Big Bear lake is one of the few places in California which experiences all four distinct seasons, so be prepared to wrap up warm if you go in the winter months! 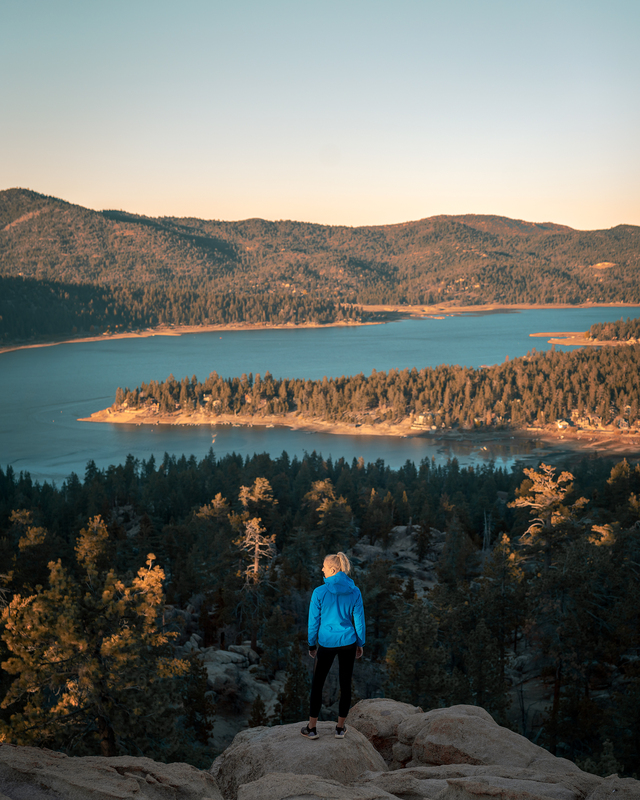 Take a morning walk along the Alpine Pedal Path trail at sunrise to get a final dose of the natural beauty at Big Bear Lake. Feast on your last epic breakfast at Alpenhorn, fill your boots savour every bite! 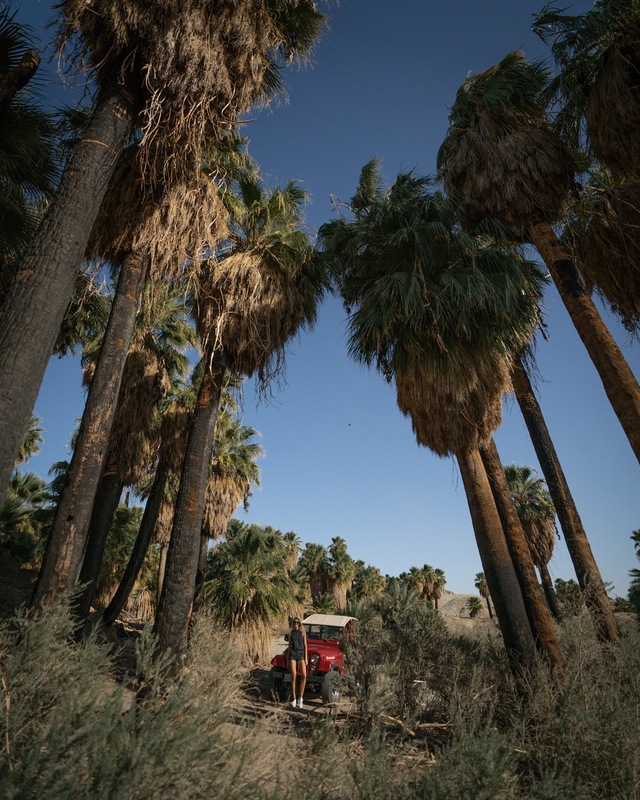 Pack your bags, check out and start the 2 hour drive to Greater Palm Springs. Check into Sands Hotel & Spa, drop off your bags and get into some warm weather clothing – you’re in the desert now! Top tip: this hotel has an amazing Moroccan themed interior which is perfect for photos! Head out on a Red Jeep Tour of the San Andreas Fault. This is one hell of an experience and really grounds you in the beauty and power of the earth. You will drive through the fault line between the Pacific and North American tectonic plates and then explore the surrounding canyons. It is pure, raw and rugged terrain which is crying out to be explored. Grab dinner at Birba’s. This restaurant specialises in pizza and even has a vegan cauliflower crust with pistachio pesto. Yum! 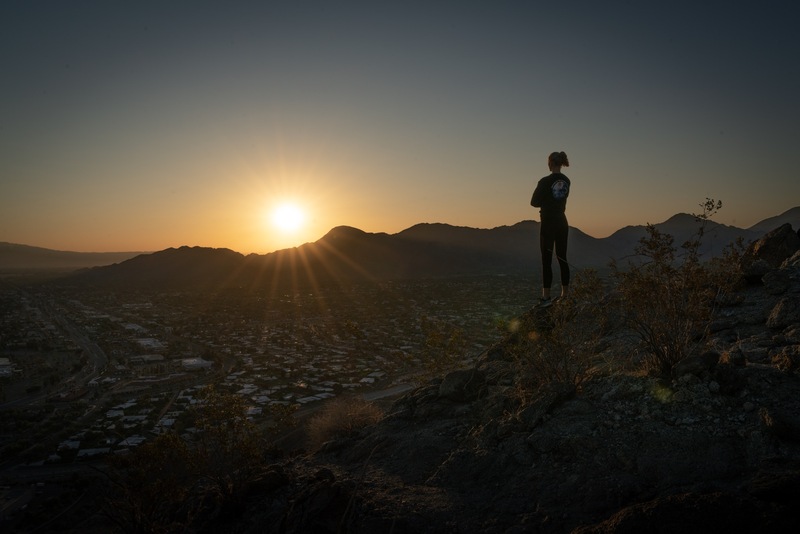 Get up bright and early for a sunrise hike over Palm Springs. I recommend the Bump and Grind trail. It is 10 minutes drive from the hotel, short, sweet and sweaty; taking you up to a peak with the perfect view for sunrise. 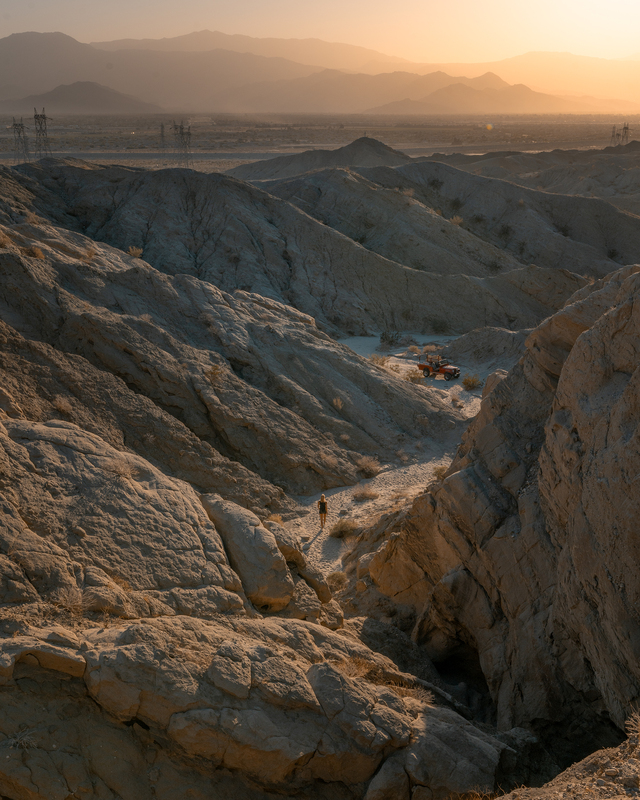 Just make sure you wrap up warm as the desert is chilly at night, and take a torch with you for hiking in the dark. Afterwards head straight for breakfast at IW coffee which has an extensive menu (the avocado toast is the bomb) and the most diverse selection of coffee’s I have ever seen; all of which use beans roasted in nearby Joshua Tree. You can then use the rest of your day as some much needed downtime. Enjoy soaking up the desert vibes, relaxing by the Sands Hotel & Spapool and exploring the healthy eateries in the surrounding area (don’t miss Wildest Greens and Luscious Lorraine’s). If you’re feeling more energetic then I recommend heading up the renowned Aerial Tramway, the worlds largest rotating tram car which travels over 2 and a half miles along the cliffs of Chino Canyon. At the top you can enjoy view points, restaurants and over 50 miles of hiking trails! Enter the Park at the south entrance near Cottonwood. This is a quieter entrance which takes you through the less busy areas first, before you arrive at the more well known hot spots at the top of the park. Stop off at Cholla Cactus Garden. This area is home to millions of “jumping” cholla cacti. It is a pretty awesome sight, but remember they’re called jumping for a reason so try not to touch them! Climb around at Arch Rock. 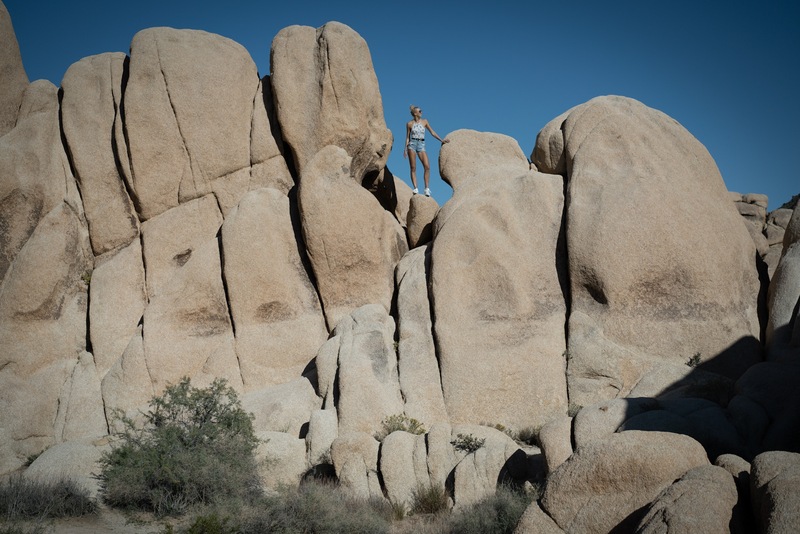 Joshua Tree is home to huge piles of rocks which are the perfect spot to channel your inner child and climb around. I loved this spot and ended up spending hours there! Plus, if you make it to the top of a pile you are rewarded with incredible views. Admire the Joshua Trees. As you drive towards the north of the park you will soon be surrounded by millions of the iconic Joshua Trees in all directions – literally as far as the eye can see! You can just park up at the side of the road to have a look, but my favourite spot to see them was at the Hall of Horrors, a well known spot for rock climbing. Watch sunset. I recommend climbing up the rocks at Hall of Horrors to get the best view. If you stick around you can then see moonrise and the whole Milky Way will reveal itself above you. Joshua Tree is a recognised “dark sky spot” which means you can literally see the universe with your bear eyes. Incredible. Grab dinner in the town of Joshua Tree. I recommend Natural Sisters for a delicious vegan black bean burger. If I had more time in Joshua Tree I would have definitely liked to have camped out over night and done a hike or two. A couple which were on my hit list were: “Willow Hole & the Wonderland of Rocks”, “Warren Peak Hike” and “Ryan Mountain”. I also heard that Keys View is a popular spot for sunset. That’s it! Time to store away the incredible memories you have made and head home. I recommend booking an afternoon flight from LAX (using Air NZ of course!) so you can sleep on the way home and wake up in the UK. This also means you have time to spend your morning at leisure in Greater Palm Springs before the 2 hour drive to LA. I recommend taking a morning run underneath the palm trees and enjoying a nourishing breakfast as Luscious Lorraine’s before you hit the road. Make sure if you do fly with Air NZ that you use their lounge at LAX, it recently won an award for being the best Star Alliance lounge in the world; in part due to its rooftop terrace which overlooks the airport. Don’t miss it! 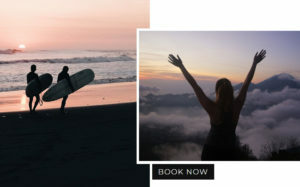 I flew with Air New Zealand through their #DreamBiggerFlyBetter partnership with Visit California. They fly daily from London Heathrow to LA. I was lucky enough to fly Business Premier which meant I enjoyed a lie-flat bed with memory foam mattress and duvet (heaven! ), a three course silver service menu (including vegan doughnuts!) and a speedy in flight wifi service (I was ridiculously productive!). As a result I arrived into LAX feeling refreshed, rested and energised for my road trip. 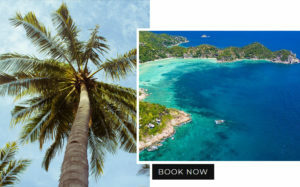 To book your flight with Air New Zealand click here. California blew me away, yet again, with its stunning scenery, relaxed vibe and abundance of natural beauty. This road trip gave a taste of the diversity of this state, including beaches, deserts, lakes and mountains. It was the perfect way to dip my toe into more of what California has to offer. I can’t wait to return and explore even further! 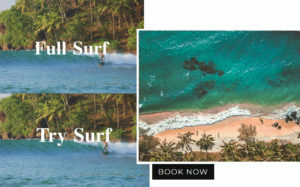 To plan your California trip, click here! This blog post is produced in collaboration with Visit California.